It’s nearing the end of October. Canadian thanksgiving has just passed, American Thanksgiving is around the corner and the sidewalks of Vancouver are covered in a layer of freshly fallen leaves. It’s a seasonably rainy day and I am sitting inside the cosy space that’s known as The Pie Shoppe. Andy French is in the back prepping cinderella pumpkins–grown at a local, inner city farm–for pumpkin pie, while her sister Stephanie sits with me and shares some of the story behind their business. We chat over a cup of micro-roasted and hand brewed Brazilian coffee and a glorious piece of pumpkin pie. “If you had reached out to me to meet up two weeks ago, I would have said, ‘Sorry, we are too busy,’” Stephanie explained. It’s no surprise that the holidays are their busiest times of the year–one of their friends even flew out from Montreal to help keep up with the demand for pie during Canadian thanksgiving. 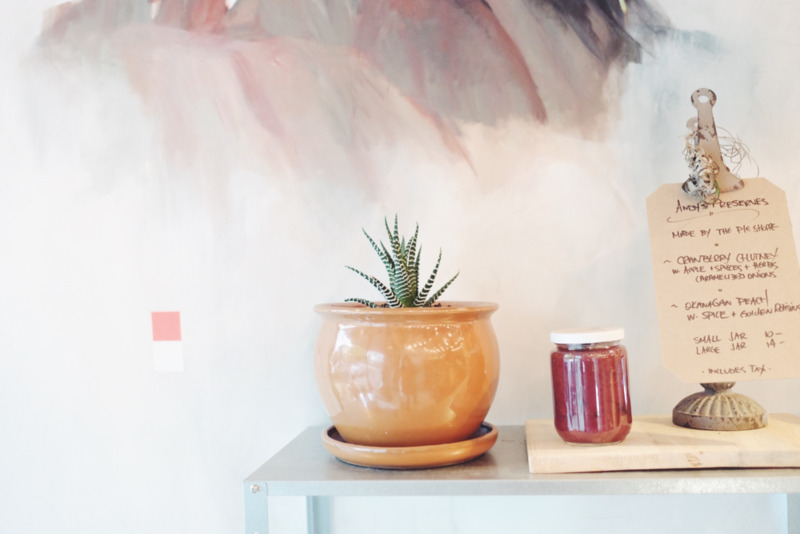 Tucked into a quickly gentrifying corner of Chinatown, The Pie Shoppe has a tiny footprint of three hundred and ten square feet. In this little space, Stephanie and Andrea run a bakery, a micro-roastery called Panoramic Coffee Roasters, and maintain store front. For the past three years, they have been the sole proprietors, managers, employees, roasters, ingredient-sourcers and bakers. As creatives–both graduates of Emily Carr–and artists who thrive on the art of making things, It seems Stephanie and Andrea wouldn’t want their business run any other way. Though they operate under the name The Pie Shoppe, it turns out, their coffee program came first. “Pie has become the vehicle that allows us to experiment with coffee” Stephanie shared. After completing a business development course through the YMCA, and visiting shops like Stumptown and Heart Coffee Roasters in Portland, Stephanie was compelled to start a business that would take the mystery out of coffee roasting. She purchased a 2lb Sono Fresco coffee roaster–a machine chosen because it doesn’t require a lot of space, nor city permitting or an overly hefty initial investment–and began roasting on the rooftop of her apartment. Vancouver's Skyline was the backdrop for her roastery and the genesis of the name Panoramic Coffee Roasters. Initially Stephanie and Andy began selling pour-overs of freshly roasted beans at farmers markets, and even dabbled in subscription based sales. As their passion for coffee grew, so did their understanding of the constantly evolving nature of beans as a seasonal and natural product. At their small scale, Panoramic Coffee understood they didn’t have the buying power to manifest farm-direct relationships–the'd have to operate through middle-men. Pie, on the other hand, allowed for this. Pie allowed them to source ingredients from–and build a community with–local farmers in the Okanagan. Of course, Stephanie and Andy also had to ask themselves the practical questions: “What can we make and not get bored?” and, “What can we make in this space with a home oven?” Pie was the answer. It just made sense. "It's all about the atmosphere you create around coffee," Stephanie shared. In the case of The Pie Shoppe, everything in the space carries a story. There is the painting on the wall of Mount Edziza by their friend Tamara Skubovious. Then there are the gorgeous ceramics–some plates and bowls made by Stephanie, others by their friends and local artisans. In a sense, Stephanie and Andrea's shop is an homage to their creative community. In a sea full of specialty coffee trends and homogenization, it's refreshing to encounter a shop that has been curated so organically. Once or twice a week Stephanie and Andy set up their Sono Fresco on the sidewalk outside of The Pie Shoppe and roast the single-origin beans they have in stock. “It starts a conversation,” Stephanie explains. As neighborhood friends and strangers walk by, smell the coffee being roasted, they often stop to talk. One conversation at a time, the mystery is taken out of coffee roasting and is instead revealed in coffee as a seasonal, natural product. "Coffee is never the same...from day to day it's even different."